You really think Hillary wouldn't have been a better president than Donnie the disaster/? She's far more dishonest, in fact, she's made a career of being dishonest, sneakily, squirmingly dishonest, slimy dishonest. Dishonest as exemplified by her escape from the known crimes of classified materials on her private email server, escaping by political bias and unheard of special treatment by the FBI investigators (all pro-Hillary / anti-Trump). The constant stonewalling of legitimate, legal and just court request to produce documentation, to the point where a federal judge had to threaten her and her legal team with incarceration if they didn't produce. Yeah, her and her sexual predator husband are slimy to the core.
" Spoken like someone who only knows what comes from radical right wing web sites. I have heard a different story from people who have actually had personal contact with her..
Fail. Don't read 'radical right wing web sites'. This entirely from observation her in her many years in 'public' (self) service. From the White Water scandal, through Bill's predatory 'bimbo eruptions' (and other 'eruptions' as well, I'm sure), and the long litany of her and Bill's other scandals. It would be wrong to eliminate the Electoral College. If you do, then New York, California, Seattle and Chicago would elect the president, then rest of the nation could just stay home, as it wouldn't matter one bit. What possible justification can there be for the complete disenfranchisement of all voters outside of these locations? 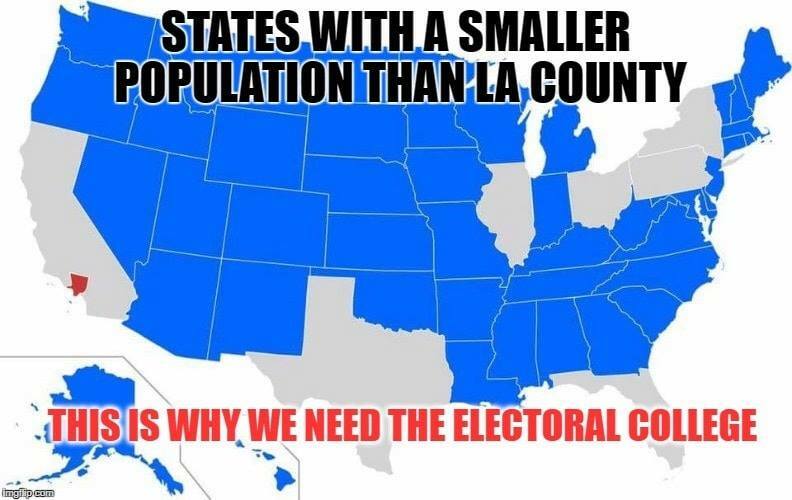 Mob rule is not what this country if founded on, and, based on the many calls for the elimination of the Electoral College, mob rule is the only thing that the Democrats believe in. Sorry I Think the votes of people should count more than states. If more people live in Chicago they often swing the state into the Democratic column, thus negating the votes of the people in Cairo and Carbondale. If you go to the popular vote everyone's vote matters. I have Trumpster cousins in blue states, so in other words their vote is nothing but a waste of their time. Just as the votes of most of America would be a waste of time, were we to get rid of the electoral college. Which was put into place to prevent such outcomes. Says the butthurt liberal who lost the last election. Why don't you just stick to knocking black people off the voting roles because they signed in without the middle initial they used when they registered. Non Sequitur. What does that have to do with the EC? (Assuming that it happened at all). Why do you consistently write such stupid crap ? We all know you have a race fetish - that to comes with being a liberal - that doesn't mean the rest of the world is racist. When liberals baselessly accuse others of racism they are only projecting their own racism on others. This is already well known. No you're not racists. You just pull out all the stops to keep blacks from voting. This didn't start with Trump it's been standard operating procedures fo Republicans for decades. Why was it then, that it was those republicans who fought against democrats who wanted to keep slavery alive ?? Over the course of the Civil War, Lincoln and other Republicans began to see the abolition of slavery as a strategic move to help them win the war. Lincoln issued the Emancipation Proclamation in 1863, and by war’s end, the Republican majority in Congress would spearhead the passage of the 13th Amendment, which abolished slavery. But you tell me that it's republicans who want to "'keep blacks from voting" ?? More likely it's those white Southerners' loyal to the Democratic Party that might want to "'keep blacks from voting" ! Do you honestly believe that this instance in NC is the only case of election corruption that's going on? That only some of the Republicans are the only ones doing it? Broward County Florida ring a bell? Or are your ears deaf to bells that don't ring in leftist tones?